In many dental practices the metal-ceramic crown is one of the most widely used fixed restorations. 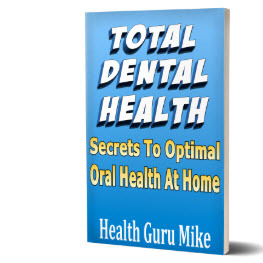 This has resulted in part from technologic improvements in the fabrication of restoration by dental laboratories and in part from the growing amount of cosmetic demands that challenge dentists today. The restoration consists of a complete-coverage cast metal crown (or substructure) that is veneered with a layer of fused porcelain to mimic the appearance of a natural tooth. The extent of the veneer can vary. To be successful, a metal-ceramic crown preparation requires considerable tooth reduction wherever the metal substructure is to be veneered with dental porcelain. Only with sufficient thickness can the darker color of the metal substructure be masked and the veneer duplicate the appearance of a natural tooth. The porcelain veneer must have a certain minimum thickness for esthetics. Consequently, much tooth reduction is necessary, and the metal-ceramic preparation is one of the least conservative of tooth structures (Fig. 9-1). Historically, attempts to veneer metal restorations with porcelain had several problems. A major challenge was the development of an alloy and a ceramic material with compatible physical properties that would provide adequate bond strength. In addition, it was initially difficult to obtain a natural appearance. The technical aspects of the fabrication of this restoration are discussed more in Chapter 24. For now, only a brief description is provided. The metal substructure is waxed and then cast in a special metal-ceramic alloy having a higher fusing range and a lower thermal expansion than conventional gold alloys. After preparatory finishing procedures, this substructure, or framework, is veneered with dental porcelain. The porcelain is fused onto the framework in much the same manner as household articles are enameled. Modern dental porcelains fuse at a temperature of about 960° C (1760° F). Because conventional gold alloys would melt at this temperature, the special alloys are necessary. Fig. 9-1. 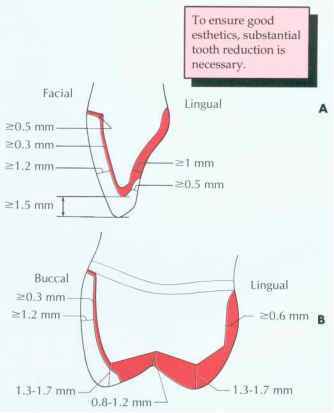 Recommended minimum dimensions for a metal-ceramic restoration on an anterior tooth (A) and a posterior tooth (B). Note the significant reduction needed compared to that for a complete cast or partial veneer crown. The metal-ceramic crown is indicated on teeth that require complete coverage, where significant esthetic demands are placed on the dentist (e.g., the anterior teeth). It should be recognized, however, that, if esthetic considerations are paramount, an all-ceramic crown (see Chapters 11 and 25) has distinct cosmetic advantages over the metal-ceramic restoration; nevertheless, the metal-ceramic crown is more durable than the all-ceramic crown and generally has superior marginal fit. Furthermore, it can serve as a retainer for a fixed partial denture because its metal substructure can accommodate cast or soldered connectors. Whereas the all-ceramic restoration cannot accommodate a rest for a removable prosthesis, the metal-ceramic crown may be successfully modified to incorporate occlusal and cingulum rests as well as milled proximal and reciprocal guide planes in its metal substructure (see Chapter 21). Typical indications are similar to those for all-metal complete crowns: extensive tooth destruction as a result of caries, trauma, or existing previous restorations that precludes the use of a more conservative restoration; the need for superior retention and strength; an endodontically treated tooth in conjunction with a suitable supporting structure (a post-and-core); and the need to recontour axial surfaces or correct minor malinclinations. Within certain limits this restoration can also be used to correct the occlusal plane. How to prep a dental veneer? Is partial veneer crown and porcelain fused metal the same?